I never set out to make an April Fool's dish. Actually, like the wolf in The True Story of the Three Little Pigs (Amazon affiliate link), all I wanted to do was borrow a cup of sugar to make my dear old granny's birthday cake be lazy while making a quiche. I mean, I pretty much threw everything in the Vitamix instead of chopping it all nice and pretty. The resulting mixture didn't strike me as faux sweet potato or pumpkin pie material until I checked it while it was baking. [And it wasn't done, so I hopped in the car to drive my son to sled hockey practice--we ate sandwiches in the car instead--and mulled over the strange appearance of my quiche.] By the time we arrived at the rink I'd conceived the April Fool's idea hook. Yes, the folks at hockey are used to my rambling and just smile and nod. I just had to decide if it tasted good enough for the blog, so between my family, the folks at work, and my visiting parents this has been thoroughly taste tested. Thumbs up. Here ya'are. 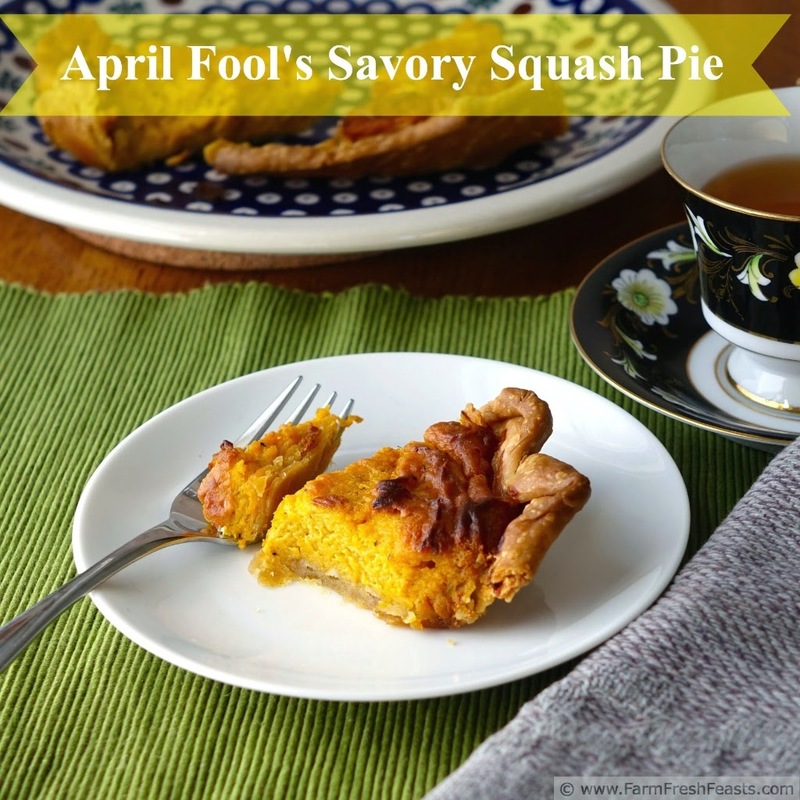 This is a rich slice of savory squash pie, so we ate ours in small slices. With a salad it would make a lovely meal (though no, I don't have any cute April Fool's salad ideas. That's what Pinterest is for!). 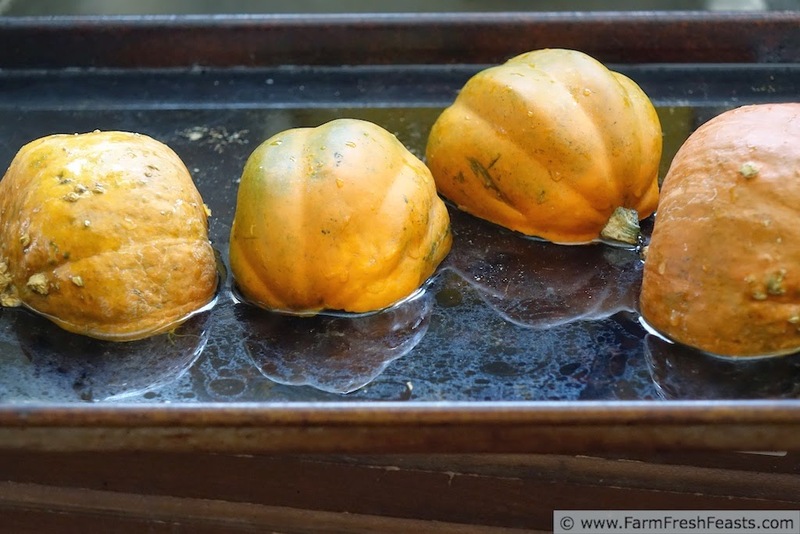 Note: to roast a winter squash, cut it in half pole to pole, scoop out (and compost) the seeds and strings, and place it cut side down on a rimmed baking sheet. Add a ½ cup of water, and roast at 400 degrees Fahrenheit for 30-60 minutes until the flesh is tender when you squeeze or poke it. Scoop out the flesh, compost the skins, and you're good to go. You can even freeze this roasted flesh if you want--it's good in muffins or waffles. I've revamped my Visual Recipe Index! For more ideas using winter squash, please see my Acorn Squash Recipes Collection, my Buttercup/Butternut Squash Recipes Collection, and my Winter Squash Recipes Collection. These are part of the Visual Recipe Index by Ingredient, a resource for folks like me eating from the farm share, the farmer's market, the garden, the neighbor's garden, and great deals on ugly produce at the grocery store. In a large (10 inch) pie pan, lay out the crust, pressing into the edges. Cover with foil. Bake for 8 minutes, then remove the foil and continue baking another 5 minutes until crust is dry and set. Decrease the oven temperature to 325 degrees. If you've got a blender, use it for the filling. If not, a food processor--or really good knife work + a whisk, would probably work. Place the squash, onions, and eggs in the blender and pulse a few times to get them chopped together. Add the first amounts of cream and cottage cheese, as well as the Manchego and the spices. Pulse a few more times to get them blended--adding more cream or cottage cheese if you're having trouble getting the mixture to move freely. 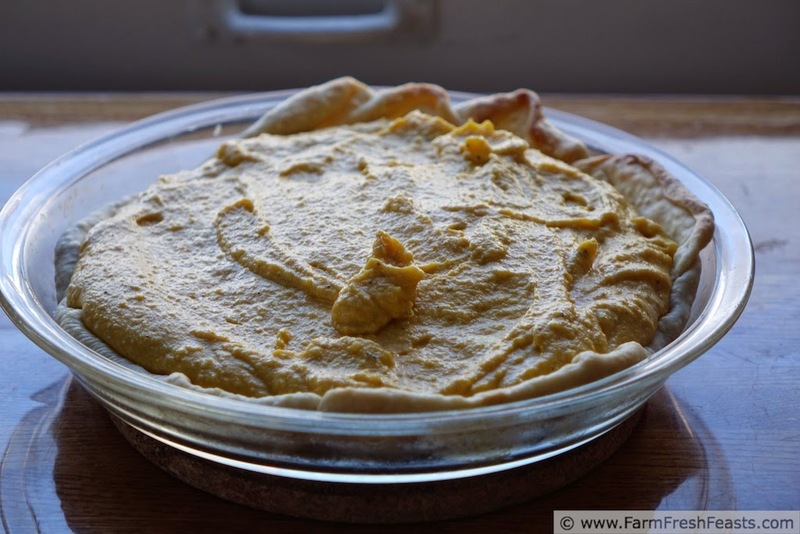 Once the mixture is thoroughly blended, spread it into the prepared pie crust. Bake at 325 for 45 minutes until the top is lightly browned on the pointy bits. Let it sit for 10-15 minutes before cutting, but make sure to serve warm. Well, I don't know about April Fool's, but this quiche sounds absolutely delicious to me. I admit I'm not goofy about April Fool's, but I am glad that we finally moved away from the scene of my attempts to epoxy quarters onto the sidewalk in front of our old home . . . I'm impressed, joke or not. I also wouldn't turn this down, although I've only got one Butternut left in my arsenal and I really want to make ravioli with him. I guess I could actually buy a squash though. Stranger things have happened. I totally understand about "actually buy[ing] a squash"! I've got some left in the stash, I have no idea why, but ravioli sounds pretty darn good to me, too. Looking forward to the recipe! 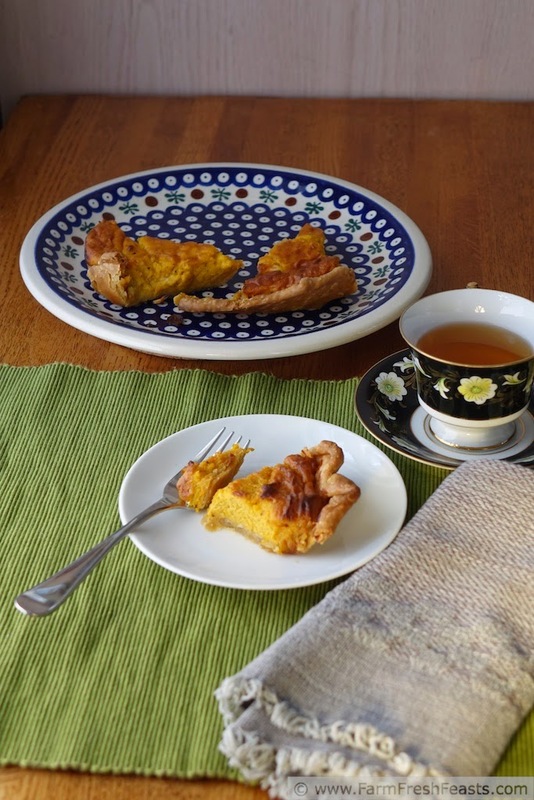 A savory pumpkin pie sounds brilliant for Thanksgiving--shoot, something like this using pumpkin would be a really cool vegetarian entree at the Thanksgiving table . . . you've got my wheels spinning here. Thanks! Hi :) Just curious, but for your Herbs de Provence do you choose the kind with lavender or without? Thanks so much! My bottle of Herbes de Provence is from McCormick and probably contains rosemary, marjoram, thyme, sage, anise seed, and savory. I say probably because it's quite possible that I refilled this bottle after a trip to Penzey's. Their Herbes de Provence mixture contains rosemary, cracked fennel, thyme, savory, basil, French tarragon, dill weed, Turkish oregano, lavender, chervil and marjoram. My son labelled all my jars and it's so easy to see when I open my spice drawers, so I'm keeping all my old jars. 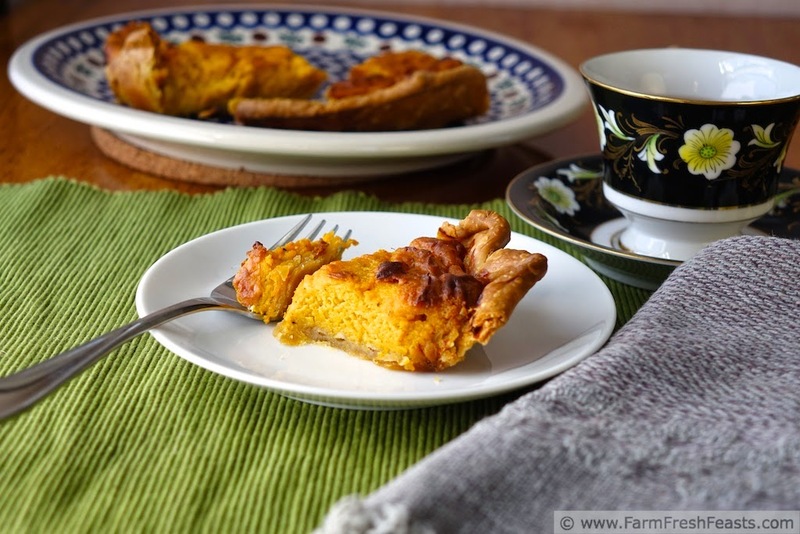 A savory pumpkin (squash) pie - wow! It's the sort of simple genius that only someone trying to use up food in their pantry or fridge would conceive of. I'm not only impressed, I'm in awe. Genius? Desperation more likely, but thank you! I'm always glad to evoke shock & awe, or just shock. I think it may be dangerous to get you thinking . . . but I'm looking forward to what your creative mind thinks up!